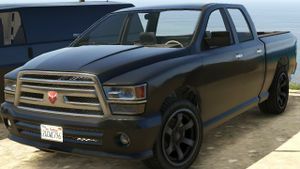 A Bison in Grand Theft Auto V.
The Bravado Bison is a 4-door crew cab pickup truck in Grand Theft Auto V. It is based on the 2009-present Dodge Ram 1500 with the bed of the 2009-2014 Ford F-150. A Bison in the Trevor Trailer. Michael De Santa and Franklin Clinton use a construction contractor's Bison equipped with a winch cable to demolish a hillside mansion. For Michael's first mission with the Epsilon Program, he has to find a red Bison in the Raton Canyon. This page was last modified on 26 December 2013, at 00:40.